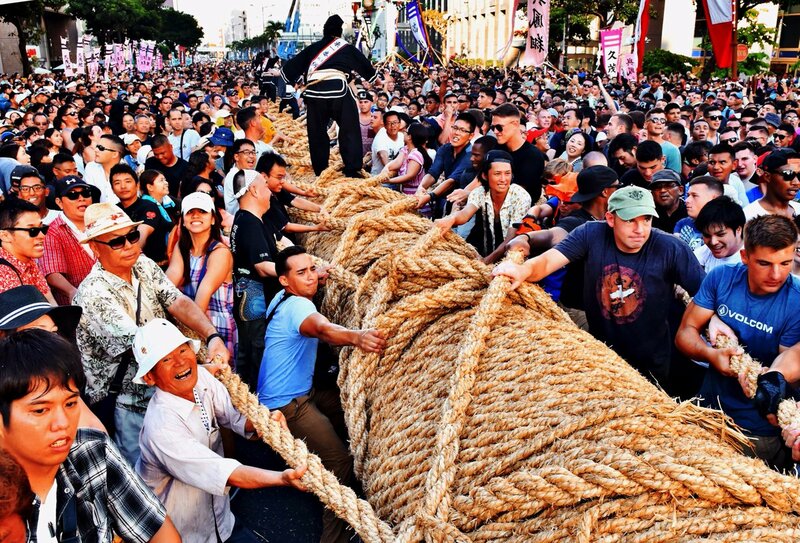 “Naha Otsunahiki Matsuri” (Naha Gianttug of War Festival) held in Naha City, Okinawa Prefecture is an event where approximately 300,000 people visit the site every year. It is held annually at the Kumoji intersection of National Route 58 of Naha City at the time of 3 consecutive holidays in October. On the first day of the event, a parade will be held by about 50 organizations such as various circles, local groups, traditional arts preservation society, etc. at Kokusai street. 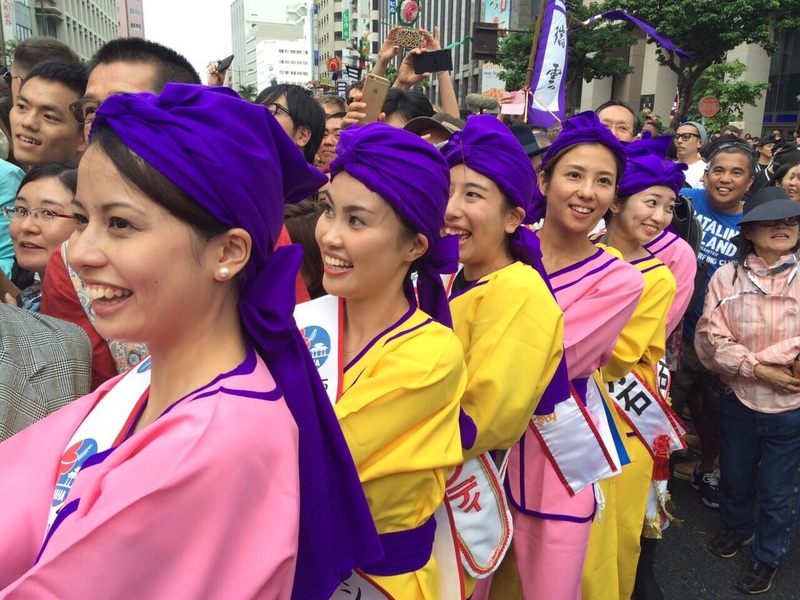 Brilliant performances and traditional arts in Okinawa will be shown in the parade. 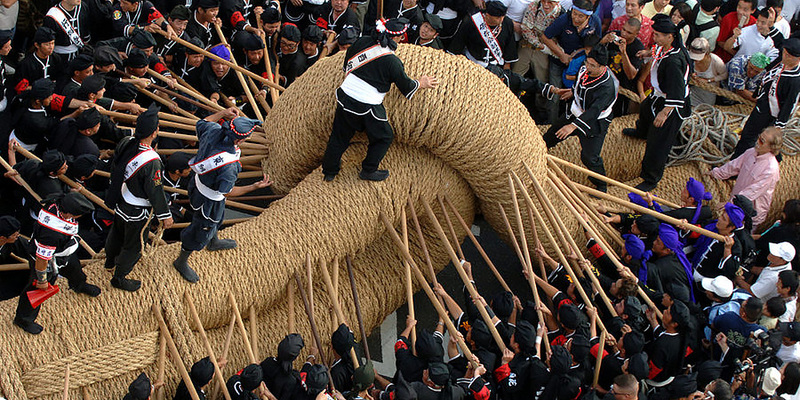 On the second day, the main event “Naha Otsunahiki” (Naha Gianttug of War) will be held. It is a masterpiece that tens of thousands of people simultaneously draw in the world’s best straw which received Guinness certification. It is the biggest Highlight of this festival. It is very impressive as many people attract the rope which is 186 meters in length. If you want to join “Naha Otsunahiki”, you had better wait at the venue two hours before the start. When it is near the start time, there are too many people and you can not move. If you bring a small baby, let’s avoid going by a stroller. Also, anyone can participate in “Naha Otsunahiki”, and in the middle of the tug-of-war, various languages ​​are flying and it is interesting. When the tug-of-war comes to an end, they will enter a competition battle of rope. 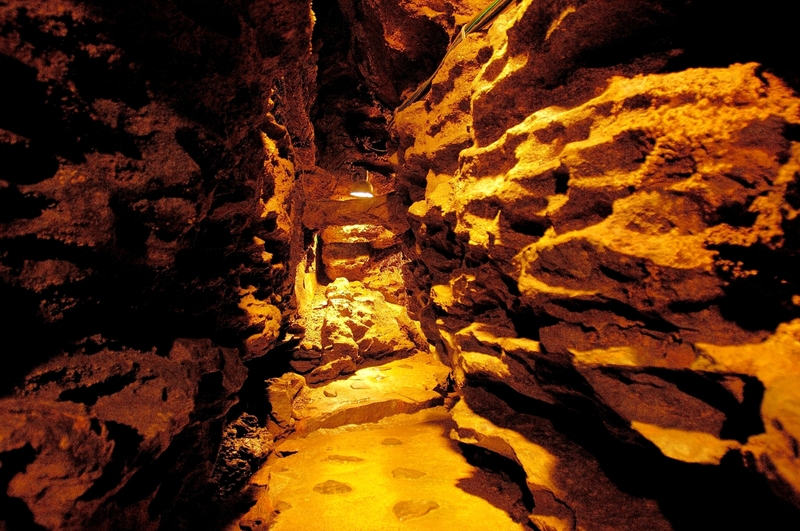 The rope of “Naha Otsunahiki” has long been considered a lucky charm, it is famous for carrying luck, and many people take home for amulets of the house. At the main venue, “Citizen Festival & Orion Beer Paradise” will be held throughout the three days. There, you can drink Orion Beer directly from the factory, and live performances by artists in the prefecture will be held. In addition, there are also fireworks festival to be held for three consecutive days, there are many events to see. 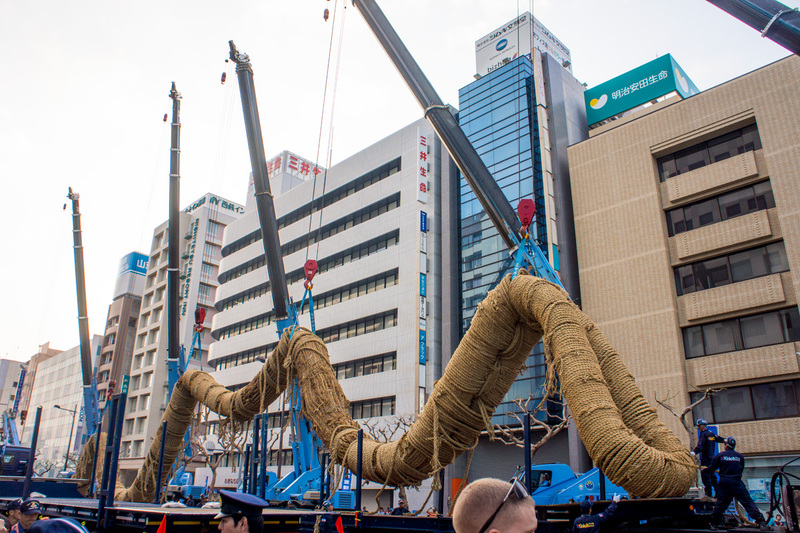 Naha Otsunahiki, it is listed in the Guinness Book of World Records as “The World’s Largest Straw Rope”. More than 15,000 people pull the rope of 200 meters in total length against each other. 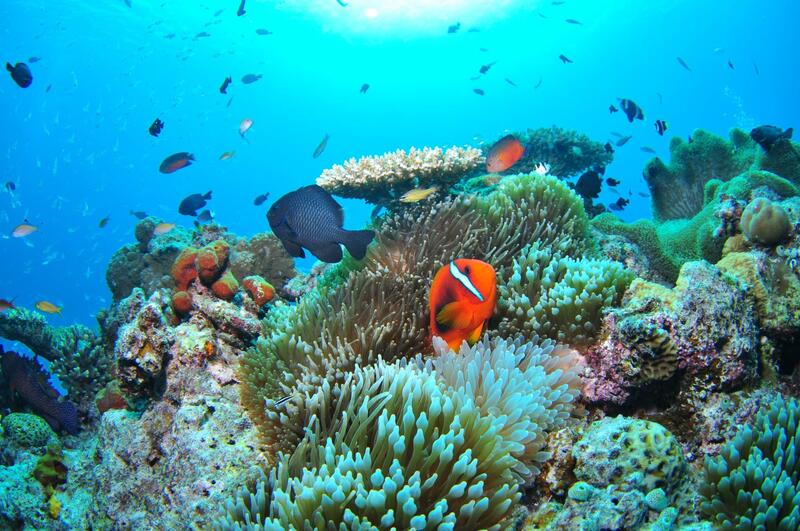 It is the popular and greatest scale event of the Okinawa prefecture with a history and tradition of 400 years. Naha Otsunahiki Matsuri is a traditional festival to be held in a center of Naha-shi in a 3 day weekend of ”the Health Sports Day” every year. Because the tourists can participate in this Tsunahiki, it becomes attractive one, too. On the first day, approximately 50 groups perform the splendid dance as “The Citizen’s Entertainment, Folk Traditional Arts Parade”. On the second day, a heroic parades of “the Hatagashira” (a flag of being ornamented) march throughout Kokusai Dori Street, the world’s largest Otsunahiki which has been recognized the Guinness authorization is performed grandly at the center of the town. While the Hatagashira fluttering, tens of thousands of people are united regardless of gender, age or nationality and the state to pull a rope against each other is right the best part. 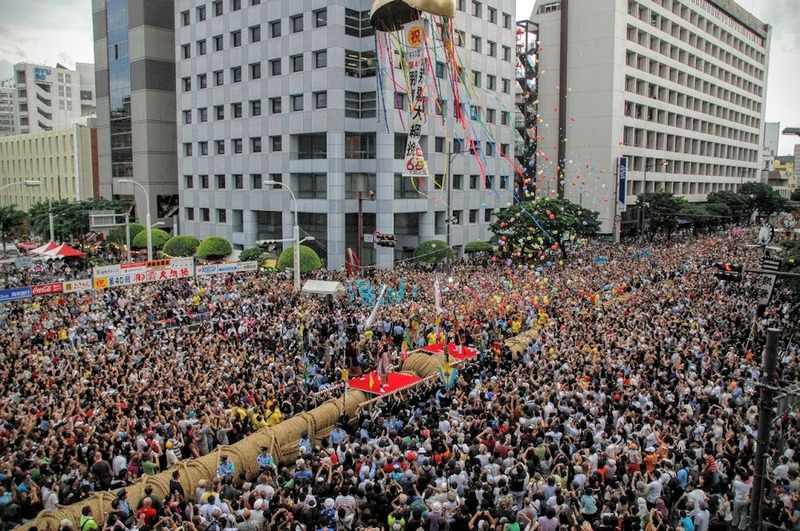 The ceremony begins at 3:15 p.m. of the second day, Otsunahiki begins to pull by a signal of the Mayor of Naha at about 4:20 p.m., and it becomes the game of 30 minutes annually. 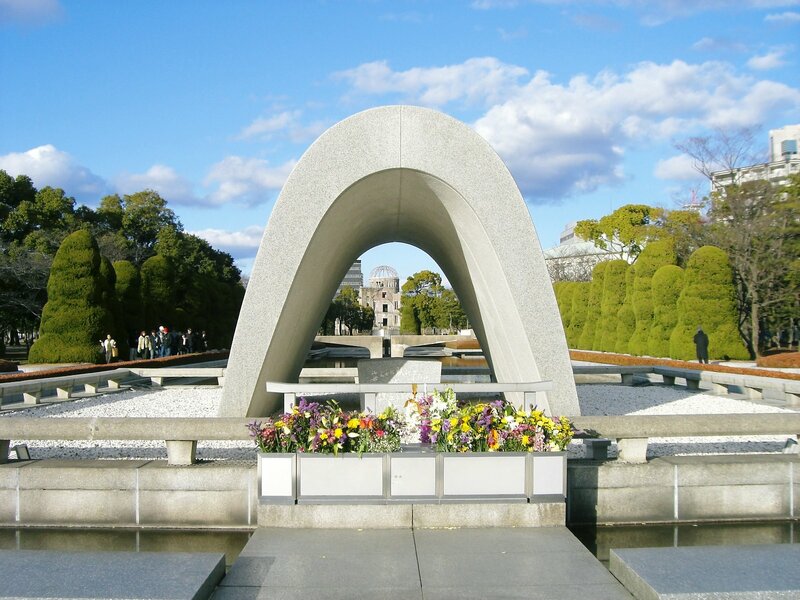 Naha Otsunahiki, which approximately 280,000 people come for sightseeing every year, is the traditional event that supported by the pride of participating local people and the long history to continue from the Ryukyu Kingdom period.